This morning, after dropping off my daughter at school, I went for a walk in Richmond Park. Hoar frost covered the brambles and trees as if someone had sprinkled icing sugar from the sky, and the fine powder had adhered to everything. It was cold, but not nearly as cold as my home-town (which is gripped in the polar vortex and reaching temperatures of -50 C). As I walked, a robin warbled, and hopped from branch to branch. It was a cheerful hopeful sound, and I wished I could send her song to all of you. It would lift your spirits, I’m sure of it. So I’m sending you this drawing with the warmest wishes I can. In the paint splattered margins in the day, it can be the smallest things that light the winter gloom. For me, today, its the bright sunshine, now matter the cold; the frost edged leaves in the early morning, as if fairies have crocheted lace edges on everything in sight; and a fragrant cup of coffee, brewing in my tiny kitchen. Tell me one of the small things that brings a smile to your face. I turned the page on the 2019 calendar. It’s week two, and things are starting to swing into routine. I have projects to focus on, and I’ve entered a bushel of new illustration deadlines into my calendar. Hopefully all that work will reap a full creative harvest! This morning, in an effort to bring my studio and my house in line with my newfound sense of openness, I brought a car-load full of odds and ends to the charity shop. As I walked away, my feet felt lighter, and my shoulders felt un-burdened. The question is… can I maintain that feeling of space and lightness? Can I let go of the old, and resist the urge to fill the gaps at home? They say nature “abhors a vacuum”. When I weed a patch of my garden, it doesn’t take long for the bare earth to be covered in freshly sprouted seedlings. I hope my house doesn’t start sprouting clutter-seedlings while I’m not looking! 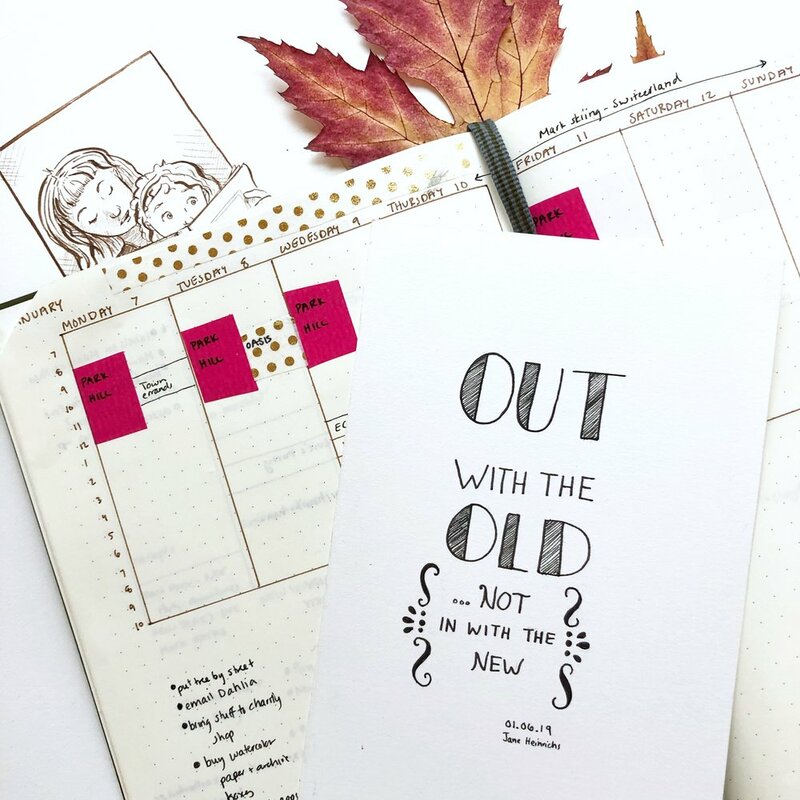 My mantra for the week is “Out with the old, and not in with the new.” There’s time for the new. We can wait for it. The “right” new things will come when we’re ready for them. In the mean time, the extra space and silence is wonderful. Happy New Year lovely friends! I hope you’ve had a wonderful New Year’s Day. I know we’re all contemplating changes, or maybe improvements, to ourselves and our routines for the New Year. I’m no different. Improvement is worthy, and something we should all attempt, for positive growth is so important. I just wanted to tell you… I think you’re just fine the way you are. You might feel more accomplished if you cut sugar, or read the classics, or learned a new language, or exercised three times per week. All that really matters is that, at the end of the day, you lay your head on your pillow feeling like you tried your hardest, you did your best, whatever the circumstances were. Some days our “best” shines with flowers and rainbows and unicorn glitter. Other days our “best” is just enough, brown and boring, but strong like the bare tree branches in winter. They might not look that impressive, but they are the armature on which glorious flowers, fruit and leaves grow on the good days. It doesn’t matter if you lose those last pounds or learn to swing-dance. May you be more of amazing self this year. More true. More vibrant. The light of your soul beaming from your eyes and heart to everyone around you. Sending love from this corner of the world to yours. Listen to my interview on Chasing Creative Podcast! You can hear me discuss creativity, working slowly (the best way) and how different places around the world inspire me on the Chasing Creative podcast! Twice a month I send out Inspiration Letters. They’re not “newsletters” because, quite frankly, newsletters are boring. No, I send out missives written from my heart about what’s really going on — in my life, in my work, epiphanies I’ve had. The letters are the running story of what it takes to live a heart-centred creative life as a person in this world. They are about my life, but I hope you see a bit of you reflected back too. The Inspiration Letters are my lighthouse, the place I shine my light so we can ALL find our way to shore (and avoid the rocks!). Alongside the rambles I’ll share updates on anything worth knowing including my book launches and of course discount codes. 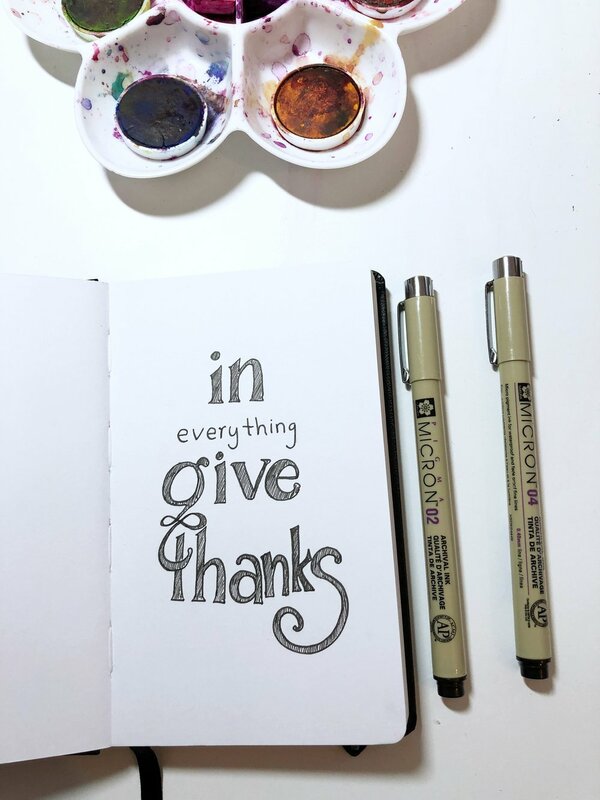 Confession: I wasn’t going to post this sketch, because I was upset with myself that the letters in the last word “Thanks” didn’t stay on a straight line. Then, I realized that I could be grateful for the imperfections as well. It’s easy to be grateful for all the wonderful things in our lives. But what about the things that stop to make us think, or teach us a lesson, or force us to grow and change, or make tough decisions? Maybe we should be doubly grateful for those things, for they are a catalyst for us to grow and change. October is a month of gratitude for us in our house. Canadian Thanksgiving falls in October, as well as my Dad’s birthday, my father-in-law’s birthday, my daughter’s birthday, and our wedding anniversary. There is so much to celebrate, but also, so much to remember. What are you grateful for today? I’m sure there are some easy answers, but are there some not-so-obvious ones as well? You don’t have to answer below if you don’t want. But I’d be happy if you paused to think about it for a few minutes. Be thankful for that hard thing, it might be more of a blessing than you realize. This is why I do daily drawings. My sketches, even if they’re rough and unfinished, are a way for me to record my thoughts and experiences from each day. 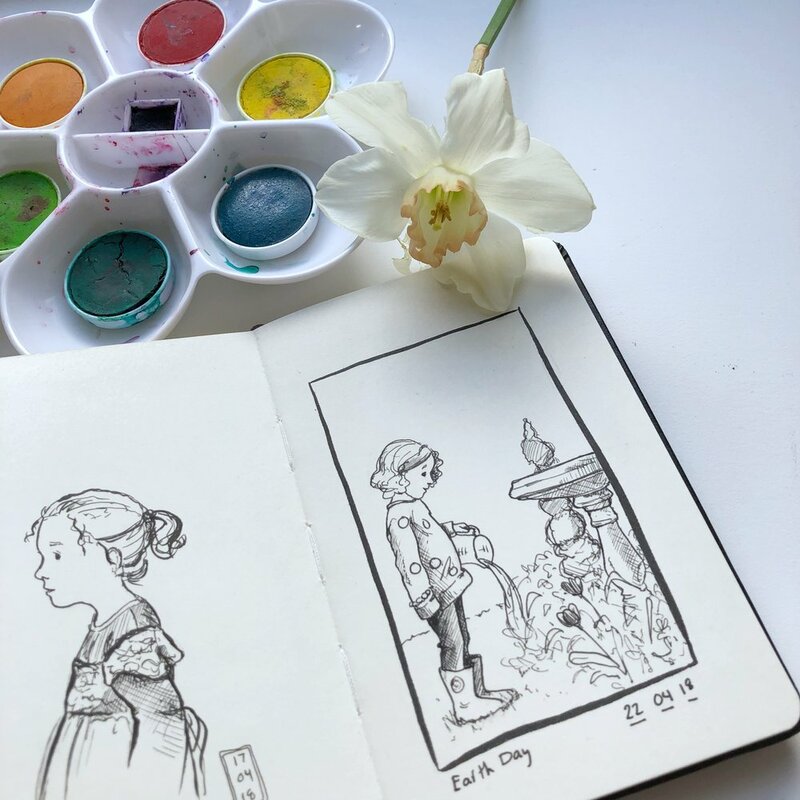 And when I look back at my sketchbooks, I can remember how I felt, where I was sitting, and all the sights, smells and sounds that were around me when I first sketched it. It’s a visceral way to honour each moment. I can’t manage a drawing every day. And that’s ok. I’d rather be gentle with myself that hold unrealistic expectations. But I try, and that’s what counts. The “almost” daily practice adds up more that you realise. 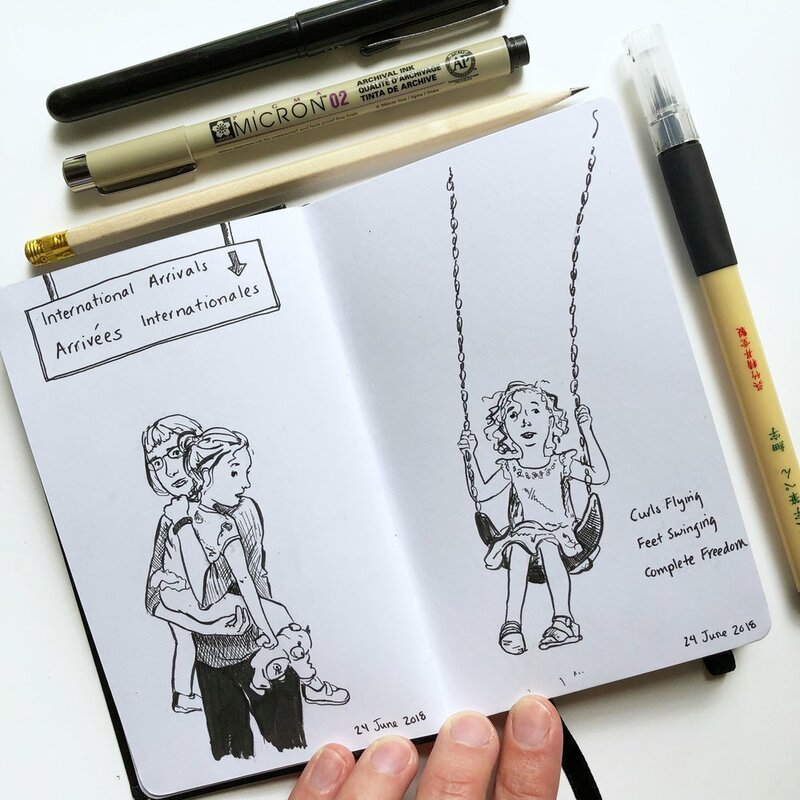 Since I started shortly after my daughter was born, I’ve filled 8 sketchbooks with tiny drawings. That’s three years of memories! What is one small thing you could do today and tomorrow? That’s my mantra: today and tomorrow... I don’t need to plan any further into the future. If I can manage something today, and then tomorrow, the rest of the tomorrows will take care of themselves. I hope you’ve had a lovely summer. We have been lying on the grass in our garden, staring at the clouds, and watching the sun circle around the sky. Of course, that’s not ALL we’ve done this summer, but a good portion of our time has been spent relaxing amongst the rose and lavender beds, trying to find respite from the heat. Now we’re slowly returning to routines. Mary switches from little-kiddies nursery to “big school” nursery, which is the year before Reception (Kindergarten). She is very excited about her uniform, and is waiting with anticipation and trepidation for the first day. I’m easing back into my studio routines, and giving myself lots of margin to let my mind wander creatively. This is something I’ve missed a lot during the rush of deadlines earlier in the year. It is such a luxury to savour the solitude and quiet. How was your summer? Let me know, I’d love to hear! We’re home in London, and gradually emerging from the hazy fog of jet lag. I’ve gently returned to my studio, and I’m remembering the wide open spaces of my hometown. I love the blue skies, and the golden and green fields. It’s a colour palette I want to explore over the next few weeks. Summer is a time for floating from one minute to the next. I still have some work to do, but there is more margin in my days. This means I’ll have time for reading on the back terrace, while the roses nod their heads in approval. The sun is streaming through the kitchen window, and a light breeze billows the curtains like flags. Yesterday we went to our local museum for wagon rides, face painting, and other fun, festive activities. Happy 151st Birthday Canada! I am so fortunate to be able to call three counties home: Canada, Great Britain and South Africa. They are such great nations, so different, and also alike in amazing ways. I love having the diversity and richness of all the traditions in my life; from maple syrup, to afternoon tea, to enjoying the perfect braai (bbq). There is so much to celebrate! We are coming out of the heavy fog of jet lag and emerging into the sunshine of the Manitoba summer, pushing our toes through the long green grass and running our fingers along the petunia flower heads waving in the breeze in the flower pots. 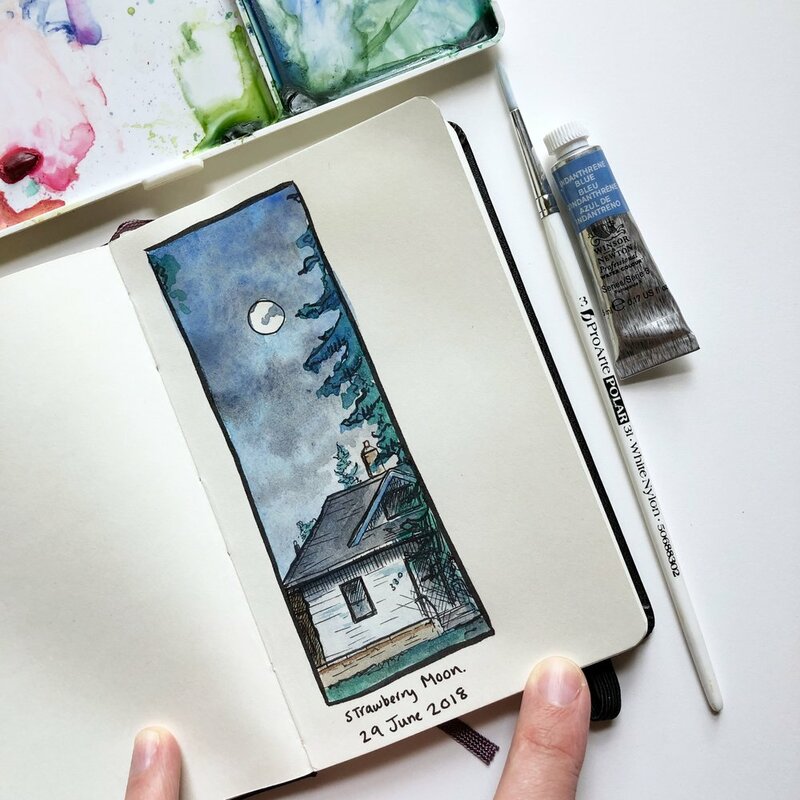 One of my goals for this trip to my hometown in Canada is to record as many moments from each day in drawings and journal entries. (Swipe left to see the pages so far) . 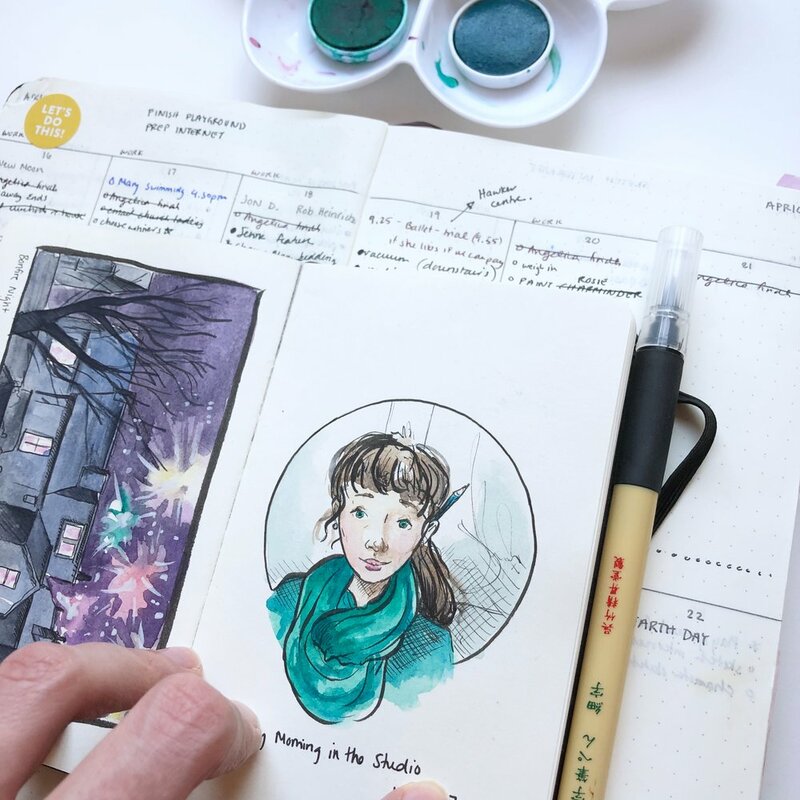 I want my sketchbook to be like a visual diary, or graphic novel, of our time in Manitoba. I want to record the wide open sky, and the adventures my daughter experiences under it. I will post flip-throughs in my instagram story daily, as well as photos of each page here on my feed. I hope you enjoy coming along on this adventure with us! Take a deep breath. Wherever you are is where you’re meant to be. It’s the perfect starting place for the journey ahead. Where do you want to go? All it takes is small, slow steps and you’ll get there. This was a two cup of coffee morning. It’s funny how best-laid plans often get changed at the last minute, isn’t it? I had my whole day organized: from what I was going to draw, to what I was going to buy at the green grocer. Then Mary woke up with a fever, and all those plans flew out the window on the spring breeze. At first I was panicked. Oh no! So much to do! But that same spring breeze pushed the scent of deep purple lilacs into the house and reminded me to stop and enjoy the moment. The morning was cool and washed-clean after a midnight rain storm. The day might not go as planned, but maybe it would actually be better than I visualized! I put a load of laundry in the washing machine, which I would hang out to dry later in the lilac scented sunshine. I popped a Care Bears movie in my laptop for Mary to watch while I worked, with her curled on the cushions beside me in my studio. Do you know what? I got more done than I expected! Then we wandered to town to buy more watercolours, have a coffee, and stop by the greengrocer to fetch veggies that aren’t wrapped in plastic. It was a good day after all! And those two cups of fragrant coffee were the perfect pairing for my revised expectations. What are you up to today? Is it going as planned? “Mommy, I’m a real ballerina!” Mary delights in her ballet classes, and tippy-toes and twirls around with joy and abandon. I love being able to record these moments of her life in my sketchbook. I started sharing my sketches on Instagram shortly after she was born. I felt very isolated, as many new moms do, and I needed a way to connect with the outside world and to re-connect with my creative calling. I challenged myself to do a drawing a day, taking no longer than 15-20 minutes. Of course, I couldn’t manage every day when I started, nor can I manage sketching every day now. At the beginning motherhood was very challenging and often absorbed every minute of the day. Now I’m busy with both motherhood and an illustration career. But I still relish my time sketching in my tiny notebooks. When I started I never imagined that anyone would follow me, and I’m grateful for every one of you and all the fantastic friendships I’ve made through this journey. I also never imagined that any brands might reach out to me; that was something that only happened to “real” bloggers. Last week my absolutely favourite pen company, Kuretake, contacted me and asked if they could send me some pens. I was delighted and honoured. I love their brush pens. Their nibs keep their flexible shape after extended usage. I use these pens all the time. Absolutely the best brush pens for illustration, in my experience (and I’ve tried them all). I thought Kuretake would send one or two pens, but they sent me a whole envelope full! I can’t wait to experiment with them and show my drawings to you in the next few days and weeks. Thank-you again for being there for me every day, and following along on this journey of artistic discovery and motherhood. It means more to me than you know. How is it already almost May? I thought it was February yesterday? Haha! Approaching the beginning of a new month and finishing a big project means I’m realigning my goals and priorities. This morning, over a frothy decaf latte, I made my list of goals and intentions for May in my Powersheets Goal Book. Then, to make sure I wasn’t overwhelmed by it all, I drew a little mini-me in the margins giving me encouragement in a speech bubble. So, that’s my daily drawing today. A little boost of encouragement for myself, and for you as well. We’ve got this! We can do it, whatever “it” is. What are your goals for the merry month of May? Tell me in the comments! I’d love to know! 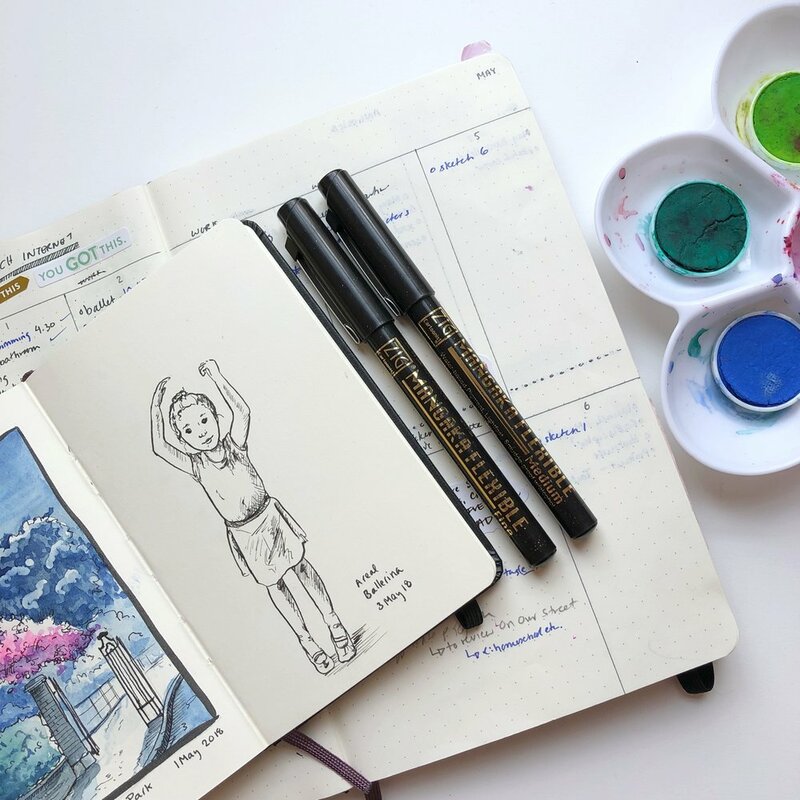 Get Creative Inspiration Once a Month! I can’t wait to be in touch with you! I promise you’ll come away refreshed and inspired. Happy Earth Day! This weekend my three-year-old daughter has run approximately 300 laps of our garden, watering each individual tulip and daffodil with her little measuring cup turned watering can. Emergently means urgently with a rush of emergency thrown in. It’s her own invention. I love that she feels this connection with the natural world. She dotes on our flowers. She listens quietly for the birds roosting in our purple plum tree. We have a tiny patch of garden, but it’s enough to open a world of nature to her. Be inspired. Breathe in. Smell the coffee. Shall we have another coffee break? Wait, I’ll just pour the frothed milk over our coffee to make lattes. I’ll have mine decaf, no sugar. How do you like yours? It’s Friday; which bitter sweet as I look the list I had for this week. It was long. I accomplished most of my important tasks, but not all of them. We are early risers, so I’ll work at dawn on the weekend days, before we head out for fun and games with our three-year-old. At the end of the week I try to take a deep breath, and to be gentle with myself. Did you know that “inspiration” is latin for “breathing in.” I can’t think, or be inspired, unless I’m relaxed enough to let the breath flow freely. I chatted about that in my last monthly newsletter (which is a monthly meditation on creativity). Not on the list? You can read the back issue at THIS LINK, and if you’re inspired, please sign up. Next week I’ll be talking about being gentle with ourselves. I promise you’ll be inspired. Anyway, if you were here for coffee we’d talk about lists (how to do you make yours? Bullet journal? Sticky notes? Digital app? ), about breathing, about being gentle with ourselves even midst the chaos of daily life. And how important it is to stop and smell the fragrant coffee. What are your plans for the weekend? And please head over to read the back issue of my newsletter. It’s my gift to you for being such lovely and inspiring friends.